Good location, but couldn't wait to get home! We stayed here for a week from 7th January and couldn't wait to get home! The only thing platinum about this hotel is the location. We had room 326 on the roadside it got no sun and was always freezing cold. Asked to be changed 3 times but the rude reception staff were not interested. The dining room was like school dinners and the food was awful, good job I like salad because it was the only thing edible. The pool area was very crowded there are plenty of sun beds if you like lying within 6 inches of your neighbour. The drinks are very expensive and you shouldn’t have to pay for Wi-Fi in a supposedly 4 star hotel. The rooms and the food in this hotel deserve no more than a 3 star. We have just arrived back from a 7 day winter sun holiday. The hotel was very nice, it was spotlessly clean and the staff were very polite. The food was plentiful and hot and was of a very good standard. There were always 2 or 3 dishes of display cooking. The location was excellent, in a not too busy area. There are nice walks to La Colleta in one direction and a good long walk through Playa De La Americast and on to Los Cristianos in the other direction. Prices were quite high for the drinks in the hotel. About 8 Euros for a beer and a Baileys. But we found it just as expensive in a lot of the bars anyway. On the downside the pools are quite small and the gym consisted of just 2 exercise bikes from the 1970s. 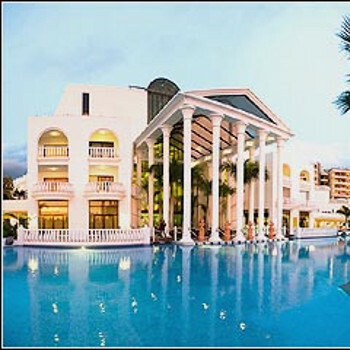 We have stayed at the Princess hotel in Masapalomas in Gran Canaria and we preferred that one to this. I would say that this was a 3 rather than 4 star hotel. We had a good time, but probably wouldn't go back. This is more to do with the resort than the hotel though. We arrived home Tuesday 8th March 2011 after an 11 night stay at this hotel and had a really good holiday. There was nothing we could fault, the staff were pleasant and helpful, the rooms were a good standard with comfortable beds. We could not fault the food and they were replenishing the food bar all the time. We shall definitely go back. We were a party of 20 (14 adults, 3 teenagers and 3 smaller children) and had 6 rooms in total. We were very pleased when we arrived at the hotel as it was very clean and the reception staff were very efficient. My husband and I had room 2023 which was lovely and spacious but after 2 nights asked to be moved due to the droning of the air conditioning units from the hotel next door. The Thomson rep requested this for us and within 2 hours we were given a suite (which had 2 double beds, a sofa bed, a plasma TV and a sea view). You could not moan about the food in the restaurant as there was always plenty of choice and it was frequently replenished. The hotel was close to everything and the lift at the back of the hotel took you down to the promenade which then went down to the beach. The entertainment was ok but we were close to bars etc. so we would have a wander and a drink plus it was cheaper to drink outside the hotel. There was the usual issue with people putting towels on sunbeds but have to say we always managed to get a bed even if we had to reserve them at 7am! We found that if you went out the back of the hotel (by the pools) if you went over the bridge to the right there was some steps that took you up to a sun terrace that not everybody realised was there which had plenty of sunbeds and a large sun canopy. This was our first visit to this hotel. We have stayed in hotels all over the world and this one was of good quality for a hotel in Tenerife. We are quite fussy but are pleased to say we had no complaints. It seemed to us to be a good solid (Spanish) 4 star hotel. Hotel cleanliness was very good, quality of food at the evening buffet was good and we would imagine that most people should be able to find something. We stayed in a sea view room to the rear of the hotel. Its worth paying the slight supplement for a sea view room as soom of the other rooms overlook the road. We would recommend requesting a high floor as some of the rooms were below street level. There were no family rooms available so we settled for a twin room for family occupancy. The room was more than adequate in terms of size. There were two double beds and a large leather sofa which converted to a bed. There was plenty of floor space. The room had been recently refurbished and had good quality furnishings and a large flat screen TV with international UK channels. The balcony was much larger than average. The pool area was smart and clean. Sunbeds were readily available although as with most hotels the "no reserving sunbeds" policy was largely ignored by guests. The pools were quite cold as these are not heated in the summer season. We have stayed in the Guyarmina Princess, Costa Adeje many time since the Hotel opened, at first it didnt have a beach nearby, but now it is great for all the family, nicest area of Americas. The Hotel has the best position of all just a lift to the beach. Most rooms this year have been refurbished to a very high standard,and the choice of food is excellent. The sunbeds were easy to find even at this time of year and plenty of brollys. This is the first time we have visited your website and are surprised at the moaners,if anybody is planning to go to Tenerife for the first time give this Hotel a try great value for money, We have to go on a diet now to get in shape for our next visit. Just back (literally as only got home 24 hours ago) and felt I needed to add some positive comments to the negative ones posted by previous entries. Wasn't too sure about the hotel having read some of the comments on this site. The hotel is massive but during our entire 2 weeks, we had no issues with getting sunbeds together (even on day 1 when we arrived at 2pm)unlike La Siesta 2 years ago when you needed to be up at 6am to get a single bed never mind 3 together. Location was ideal as it's not in Playa De las Americas, but the quieter Adeje. Los Cristianos and PSLA are only 5 mins in a taxi but a world away! Taxi prices have shot up this year but that's not the hotel/Thomson's fault. Room was massive and cleaned daily. Toiletries were refreshed too but who really uses hotel stuff - get a life and buy a bottle of shampoo/shower gel! Our room was on the 3rd floor which only got the sun till around 2pm but we were so glad as it was 90+ every day and meant the room was cool when you came back from the pool. Entertainment team of Consuela and Maria tried really hard to keep the kids amused, our daughter loved the mini club and mini disco and helped her make friends at the pool. Not on a par with a Thomson Family Hotel in terms of kids activities, but didn't miss singing Thomson the Dog this year nor listening to wannabe entertainers. Evening entertainment was a bit hit and miss and was a good excuse to go to Los C or PDLA as an alternative. Charlie Chaplin was great, Elvis wasn't!!! Prices in resort are far more expensive than last year but you can still get a good lunch at reasonable prices in front of the hotel. Hotel prices in line with UK. If you do any trips, Siam Park is a must. We spent 8 hours there on the water rides, waves and Siam beach. Best water park I've ever been too. Waves were amazing and the Tower of Power!!! Felt I had to reply as the holidaymaker above has said we nearly cancelled our holiday due to very negative reviews of this hotel. We had a lovely room on the 3rd floor, views right across the bay and a 2 min walk from the beach. Hotel was kept very clean, rooms were mopped, brushed every day and toiletries were replaced every day.I am a very fussy eater but did not struggle once in the fortnight.Choice was excellent from barbequed meats every night to delicious omeletes and pancakes.Choice of cakes & delicious icecream was superb. Drinks in the hotel were no more expensive than some of the bars near the hotel, we paid 12 euros a vodka and a Bacardi with no mixer at the beach bar opposite the hotel.The hotel has happy hour 3 times a day where you can get all spirits, beer at half price. Staff were very pleasant. The ladies in the shop in the hotel were the only people in the fortnight that were unpleasant, infact they were down right rude. Our only gripe would be that the door to the prom shuts at 9pm and that the security guard is at the door until after 11pm at night, he could let people in. Yes we would definately visit this hotel again. Excellent location, good food.